Bets on how many 90’s references I can make in one blog post? I have a few great loves in my life: my family and friends, NYC, Seth Rogen, and the 90’s. As a child of the 90’s I got to experience what past generations could only dream about: tamagotchis, AIM, slap bracelets, Prince William in his single years, beanie babies, and of course, the musical stylings of Sugar Ray, N*SYNC, Britney Spears (pre-head shave), Alannis Morrisette, and the Counting Crows (pre-Shrek 2). As my entrance into the real world is approaching at a velocity rivaling that of the speed of light, I find myself reminiscing on the simpler days. When the biggest scandal in Washington was a sordid encounter with a navy blue dress-wearing intern in the Oval Office, and my daily schedule included obligations such as watching the Power Rangers and snack-time (If anyone disagrees that Dunkaroos were not the best snack-time snack of all time you can leave now). If you also suffer from 90s withdrawal, symptoms include daily Clarissa Explains it All references and an unhealthy obsession with Freddie Prinze Jr, I have the cure-all. Saved by the 90’s with the Bayside Tigers at the Canal Room. 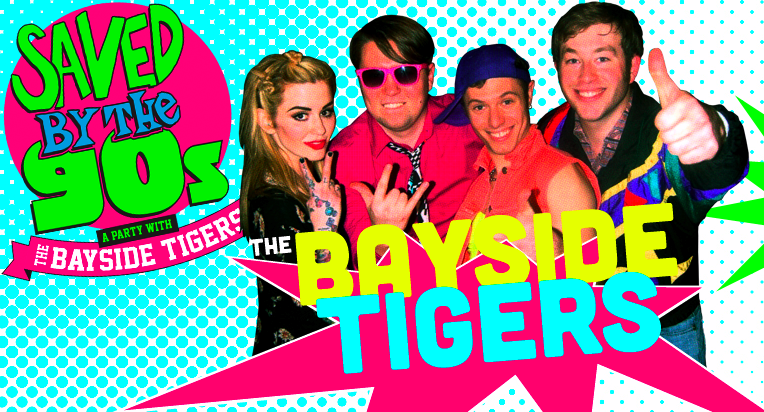 For $15, channel your inner-tween and have a freaking blast with The Bayside Tigers. They are seriously the best 90’s cover band I have ever encountered. You better be ready for a party. The Canal Room on West Broadway and, you guessed it, Canal St, is a very intimate concert venue, and with the Bayside Tigers playing, I would have it no other way. Two Fridays ago, a few of my friends and I went to see them. Coming out around 11:30 (in neon windbreakers and all), the band opened with the Saved by the Bell theme song, and proceeded to bring down the house for the next THREE hours playing 90’s hit after 90’s hit like No Doubt’s “Just a Girl”, an amazing rendition of Alannis Morissette’s “Ironic”, Smash Mouth’s “All Star”, and yes, even BSB’s “I Want it That Way”. Everyone in the band is extraordinarily talented, and you can tell they absolutely love what they do. *NOTE TO SELF* new career path: learn guitar, get singing lessons, join 90’s cover band, be awesome. After they show they came out for a meet and greet with the audience. You can order tickets online or you can wait in line at the door and get some tickets before the show. Starting in April they’ll be playing every Friday at the Canal Room! My only suggestion is if you want some liquid courage before you break out your Macarena skills (don’t even try to deny you forgot that dance), do it at the bars around the area. One Red Bull Vodka at the Canal Room is the same price as the actual ticket. Bottom Line: The Bayside Tigers show was one of my favorite nights out in NYC so far. And for as much as about 1.5 drinks at a bar, the price won’t “Sabotage” your bank account. My apologies for the lack of pictures, I was far too busy channeling my inner-Gwen Stefani to snap a few shots.